What does Canada Day look like for a bouncy castle company? A lot of our customers start planning for Canada Day a year in advance. As you have probably read in the papers, there are lots of celebrations in your area and beyond. Here are some of the cities where we you can find us. Niagara Falls, St. Catharines, Thorold, Welland, Port Colborne, Grimsby, Hamilton, Burlington, Oakville, Milton, Mississauga, Port Credit, Waterloo, Cambridge, London, Woodstock, Kitchener, Guelph, Dryden and that’s not even all of it. A lot of prep goes into making sure your Canada Day celebrations go off without a hitch. Make sure to find us at our FunZones. 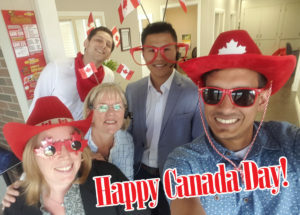 And from all of us here HAPPY and SAFE CANADA DAY! Looking forward to Canada’s 150th Birthday in 2017!